At exactly 5:15 yesterday (Tuesday) evening, President Jonathan called to congratulate me on my victory. For this, I want all Nigerians to join me in congratulating and appreciating Mr President for his statesmanship. President Jonathan was a worthy opponent. I extend my hand of fellowship to him. I look forward to meeting him soon, as we plan the transition from one administration to another. He will receive nothing but cooperation and understanding from me, who led this nation to democracy. You stood in line patiently for hours; in the rain, in the sun and then in the dark to cast your votes. Even when the vote was extended to Sunday in some places, you still performed your civic duties. You did so peacefully. You voted with your heart. 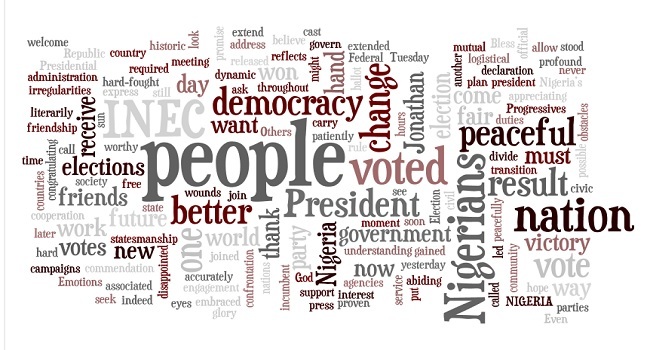 Your vote affirms that you believe Nigeria’s future can be better than what it is today. You voted for change and now change has come. INEC has released the official result of the Presidential Election. INEC has declared that I gained the most votes with the required spread and won this election. In a more profound way, it is you, Nigerians that have won. The people have shown their love for our nation and their believe in democracy. The declaration of INEC accurately reflects the will of the people. While there might have been some logistical obstacles and irregularities associated with the exercise, the result shall stand as what the people want. To me, this is indeed historic. Most people will welcome the result because it is the one they voted for. Others will literarily be disappointed. I ask that we all be circumspect, respectful and peaceful in these times. This was a hard-fought contest. Emotions were high. We must not allow them to get the better of us. This is not the time for confrontation. This is a moment that we must begin to heal the wounds and work toward a better future. We do this first by extending a hand of friendship and conciliation across the political divide. We hope and pray our friends in other parties reciprocate. I thank all the members of the All Progressives Congress, the APC, for their commitment and their hard work through the formation of the party, the campaigns and the presidential elections. Let me equally express my appreciation to the media, civil society and security agencies for their selfless service. The international press and our friends abroad deserve a fair commendation for their support throughout the process. We promise a robust and dynamic engagement with your countries in matters of mutual interest. In the interim, I call on all Nigerians to be law abiding and peaceful. The eyes of the world were focused on us to see if we can vote in a peaceful way and carry out elections in an orderly manner. We have proven to the world that we are a people who have embraced democracy and a people who seek a government by, for and for the people. We have put one party state behind us. We have voted for a government that will serve and govern, but will never rule over you. CHANGE has come and a new day and a new Nigeria is upon us. The victory is yours and the glory is that of our nation, NIGERIA. I will make a more formal address to the nation, later in the afternoon after I receive the certificate of return from the INEC.